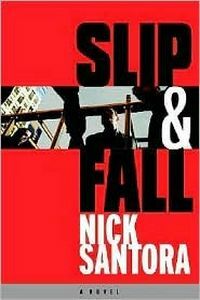 Slip & Fall by Nick Santora, a Mysterious Review. Robert Principe could have followed his cousin Jackie into the Mafia but instead attends law school and makes his wife and family proud by opening a practice in the old neighborhood. His clients are friends who need to make a will, union men who are hurt on their job but don't know how to go about getting compensation for their injuries, and the like. But after only a few years his business starts slipping. His wife is pregnant, he's behind on his mortgage, and he has other financial obligations to his family. In an effort to make some fast money, he contacts his cousin Jackie and they come up with an insurance scam. Jackie knows a man who owes the Mafia boss a $50,000 gambling debt who would be willing to take a fall if it meant clearing his debt. Jackie also knows a chiropractor that would testify to the man's injuries. The scheme nets them less than they were hoping before, but enough for Robert to pay some bills. Though Robert doesn't want to do it again, the Mafia insists he continue working for them. After trying to quit, he is threatened with his life, plus that of his wife, unborn child, his parents and his sister. When he is finally caught, the FBI offers him an opportunity to make things right. How Robert is able to extricate himself from the mob, protect his family and satisfy the FBI, is both powerful and bold. Special thanks to guest reviewer Betty of The Betz Review for contributing her review of Slip & Fall. Acknowledgment: Authors on the Web provided a copy of Slip & Fall for this review.